On Sept. 11, K.J. Martijn Cremers hosted “Active vs. 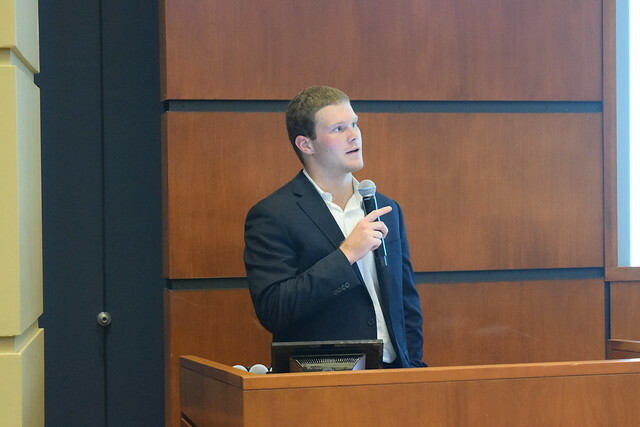 Passive Investing.” The event was the first in this semester’s Robert K. Wilmouth Speaker Series, a number of lectures hosted by NDIGI designed to further students’ knowledge of the science and art of investing. The objective of the event was to educate students on the differences between active and passive portfolio management, and to explain to them the active management measure Active Share, which was created by Cremers. Cremers currently serves as interim dean and Bernard J. Hank Professor of Finance at the University of Notre Dame’s Mendoza College of Business. He graduated from the VU University Amsterdam in 1997 before earning his Ph.D. in finance from the Stern School of Business at New York University in 2002. His research focuses on empirical issues in investments and corporate governance and has been published in esteemed journals such as the Journal of Finance, the Review of Financial Studies, the Journal of Financial Economics, the Stanford Law Review and Northwestern Law Review. In addition to his role at Notre Dame, Cremers is an associate editor of the journal European Financial Management and maintains consulting relationships with several investment management firms. Passive (also known as index) management is an investment strategy in which portfolio managers attempt to mirror a market index such as the S&P 500 or Russell 1000. Active management, conversely, is the subject of Cremers’ research. He expelled some common misconceptions about active management, stating, “Active means different. Being very active does not mean you’re trading a lot. All I mean by active is constructing a portfolio that is different [from the market index. ]” The aim of an active manager is to outperform an investment benchmark index. After outlining the definition of active management and how it differs from passive management, Cremers described how Active Share can be used to measure the activity level of a particular fund against a benchmark index. He discussed the measurement in his 2009 Review of Financial Studies paper, “How active is your fund manager? A new measure that predicts performance.” Since then, Aactive Share has become a widely used tool in the finance and investing industry and has been incorporated into the investment analysis platforms Morningstar Direct and FactSet. In his research, Cremers found funds with a low Active Share tend to underperform their benchmarks - net of costs. Conversely, funds with high Active Share typically outperform their benchmarks - net of costs. For more information on his academic research concerning Active Share, including links to research papers co-authored by Cremers, see activeshare.nd.edu. Cremers went on to explain his “three pillars of active management,” the three qualities he has identified as essential for a successful manager: the skill to identify the investment opportunities; the conviction, or courage, to translate those identified opportunities into portfolios that are indeed different [from the index]; and the opportunity to create those portfolios. It is through these three qualities, Cremers said, that an active manager has the ability to produce a portfolio that is not only different from the market index, but also can outperform the index as well. Cremers concluded by demonstrating the Active Share website, which he created and updates. The tool allows a user to input the name or ticker symbol of any U.S. equity mutual fund and view that fund’s Active Share and other related data, including equity allocation, Active Share by style and holdings duration. This data is accompanied by informative graphics and includes statistics for multiple years in the fund’s history. Visit ActiveShare.info to experiment with the tool.